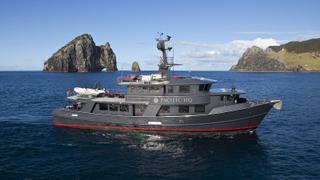 The 25.98 metre motor yacht Pacific HQ has been listed for sale by John Blumenthal at United Yacht Sales. The lounge area in the main saloon is aft, featuring two large plush leather sofas, a coffee table, Samsung 55-inch flatscreen television set, wet bar and direct access to the aft deck. Forward on the port side is a country style galley with additional seating for casual dining. On the starboard side, a separate formal marble dining table enjoys privacy and idyllic views. She makes the perfect long-range explorer yacht, as she is completely self-sufficient and carries up to 100,000 litres of fuel and 15,000 litres of water. Powered by a single 671hp Caterpillar diesel engine to a comfortable cruising speed of 8 knots, she can manage offshore forays of five months or more at a time. Lying in New Zealand, Pacific HQ is asking $3,200,000.